It’s not every day that a new and upcoming band ventures to little, old Albion to feature their music. However, on Wednesday, Feb. 3, Albion is in for a treat. Joe Hertler & the Rainbow Seekers, a Michigan-rooted band with a unique sense of groove, will be playing at the Bohm Theatre, along with guests Less is More and Cats and the Fiddler. I was lucky enough to catch a Q&A interview with band frontman Joe Hertler days prior to their Albion set. 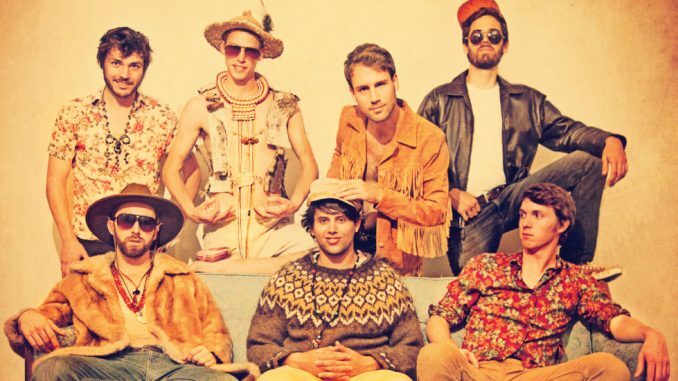 Andrew Wittland: What should Albion know about Joe Hertler and the Rainbow Seekers? Joe Hertler: We all met between Michigan State and Central Michigan University about four years ago. We were kind of a fun-time band, playing co-ops and little bars, just having a good time in college. Right after we all graduated, we decided to take things a little more seriously, and we signed a deal with Universal Records. We’re a very live-oriented band who likes costumes and stage production. We like to perform with a lot of passion! AW: How would you describe your musical style? JH: We jump all over the place. I’d say, for the most part, we’re kind of a singer-songwriter folk band with a jam elements and Motown influence. With every record, we seem to explore new places with the sounds that we’re creating. The most recent exploration is probably the Motown and soul vibe. AW: Who were your musical influences? JH: Everyone in the band each has a different influence, ranging from jazz, to blues, to singer/songwriter. I’d say the main influence has been the culmination of our experiences and events as a band. For me, I’ve always liked the divas, and I’ve been inspired by their performance styles. AW: What do you see as the next steps for your band in terms of development? JH: We’re actually working on a new record right now. We have a lot of new songs that we’re getting ready to pitch to labels, as well as releasing them to the world. Even though we are a very live-oriented band, my favorite place has always been writing songs in the studio. At this point though, we’re really just getting excited to start showing people our new stuff. With festival season coming up, the summer is looking pretty good for us. Then hopefully in the fall or winter, we’ll be out with a new record. AW: What do you like about playing at college campuses? JH: Since we all went to college, we all definitely feel comfortable with the atmosphere. It’s very refreshing to play for some young, vivacious people. They’re such pretty places too, especially the small schools; there’s always a lot of pride in them. AW:What has been your favorite venue to play at? JH: Definitely Mac’s Bar in Lansing! It’s where we played our first show and where we really got started. AW: Lastly, what’s a fun fact about your band? JH: Well, we all have some pretty intense side hobbies. I’m actually a really big house DJ and techno music fan. I actually used to DJ before I got involved with the band, I even had my own radio show. Our drummer and saxophone player both happen to be master woodworkers. One is actually a chainsaw carver and makes huge chainsaw sculptures. Another one of our members is a master clockmaker and engineering student. He makes his own wooden clocks powered by potential energy. Tickets are $10 in advance, $12 at the door and $10 for Bohm members. The event runs from 7-11 PM.